Achilles Wheel is a high energy Roots and World music/Rock and Roll band from Northern California, featuring award-winning songwriting played on numerous stringed instruments and more drums than you can shake a stick at. In the wake of their breakout performance at the 2012 Kate Wolf Music Festival, the band has been burning up stages all across California ever since. With the release of their 3rd studio recording Devil in the Yard, which is currently getting airplay nationwide as well as in Europe, Achilles Wheel further dispels the myth that jam oriented bands can’t write great songs. 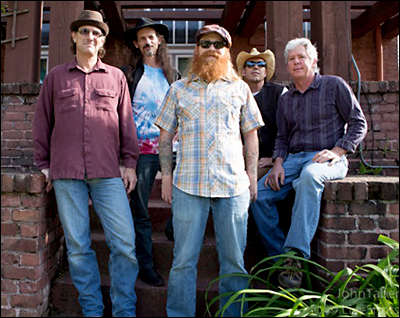 The quality of the band’s songwriting combined with stunning musicianship has earned them spots at California’s Worldfest, The Strawberry Music Festival, The Redwood Mountain Faire, The Redwood Ramble, Railroad Earth’s Hangtown Halloween, Great American Music Hall and sold out shows at Terrapin Crossroads and the Sierra Nevada Brewery Big Room. Shana Morrison, who began her singing career performing duets with her father, Van, in his Rhythm and Soul Revue, always puts in a powerful performance. With a strong, infectious stage presence, Shana's soulful voice and marvelous, sometimes magical lyrics ride on an eclectic blend she calls "Pop with a side of blues and a side of rock." Country, jazz, and R&B influences also sneak their way in to the mix as she ranges effortlessly from beguiling ballad to moody wistfulness to no-holds-barred, bluesy wailing. The San Francisco Chronicle praises Shana's "wide ranging voice that is both powerful and pure. Her vocal inflections, soaring melodic lines and sophisticated use of dynamics are impressive."